The eastern most lake in the United States, is situated within two bordering Maine towns, Robbinston and Perry. 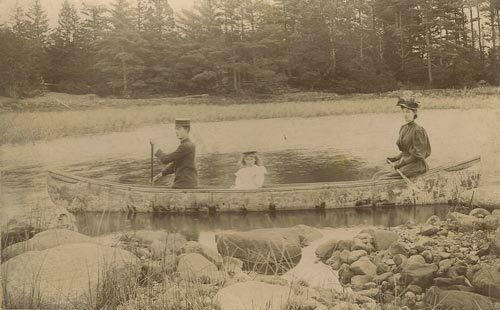 Nestled in the St. Croix Valley, not far from the Passamaquoddy Bay, the medium-sized body of fresh water was called by the indigenous people, Nesseyik (where water is muddy). According to a Passamaquoddy legend, this condition was the result of a battle between two chiefs, one in the form of a serpent, the other a giant slug. In 1763 Captain John Frost, a fur trader, established a trading post on Pleasant Point, not far from Nesseyik, to facilitate exchange with the native population. In 1794, the Commonwealth of Massachusetts paid Frost £200 for a parcel of land at Pleasant Point for the "accommodation" of the Passamaquoddy. This rocky tract of land would become the Sipayik Reservation. In March of 1786, Revolutionary War General, Benjamin Lincoln, of Hingham, Mass., with two associates, purchased from the Commonwealth a large tract of land designated Township # 1 (Perry). In October, Edward Hutchinson Robbins, a prominent resident of Milton, Mass., acquired an adjoining 17,860-acre tract of land, designated Township # 4 (Robbinston). These parcels were two of many land grants created by the Massachusetts Committee for the Sale of Eastern Lands. By encouraging the settlement of the frontier wilderness of Maine, the Massachusetts General Court hoped to generate revenues to counter the financial chaos left by the Revolutionary War. About 1787, Jacob Boyden, of Foxboro, Massachusetts, a veteran of the battles of Lexington and Concord, came to stake his claim in the woods. He built a log cabin between two streams, on a ridge, overlooking the north side of Nesseyik. 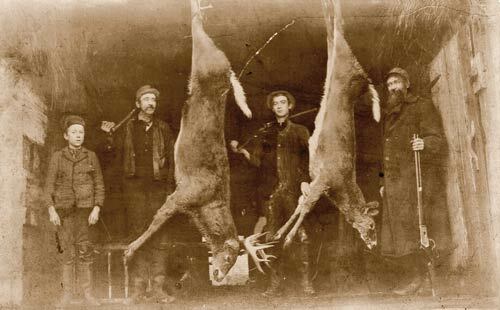 Descendants report he was, "Possessed of great physical strength and mechanical faculty, he and his sons felled the big trees for lumber, cleared the land for farming, and built a saw mill and blacksmith shop. Jacob hammered out on his anvil a gang-saw, which was successfully used for sawing logs. In the course of time he had a fine farm and a comfortable home." On November 1,1766, William Bugbee, a descendant of Puritan settlers of the Massachusetts Bay Colony, married Hannah Maxfield, in the First Church of Roxbury. Their six children, Ann, William, Hannah, Elizabeth, Edward and Daniel, were all born in Dorchester. On July 8,1785, the year following Daniel's birth, Hannah passed away leaving William a widower with several small children still in his care. Whether the loss of his wife was a catalyst, they were difficult post war economic times; William may have been lured by the cheap land and a chance for a fresh start in the emerging settlements in Maine. Sometime between 1786 and 1788, at Edward Robbins urging, he sailed from Boston Harbor to the Passamaquoddy Bay. 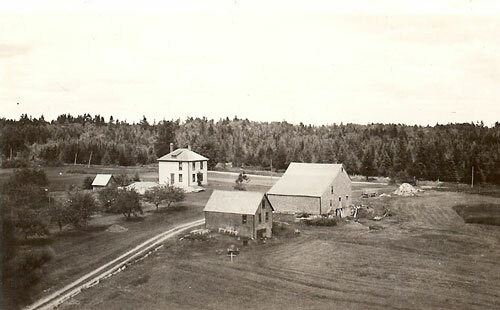 In Robbin's employ, he operated the first grist and lumber mill in the new community of Robbinston. In 1794, his son, William Jr., settled with his wife, Rebecca, in Township #1, paying five shillings for property on the Passamaquoddy Bay. Their eight children, all born in Township # 1 were; Robert, Rebecca, William, Eliza, Edward, Hannah, John Brewer and Joseph Davenport. 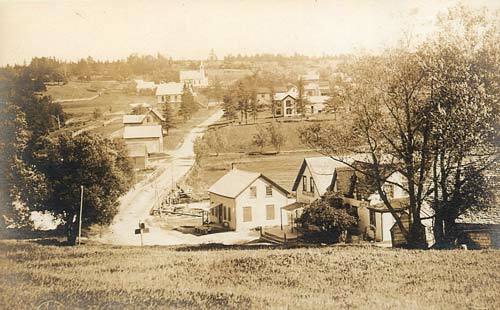 In 1818, Township #1 was incorporated as the Town of Perry; in 1820, Maine became a state. In June of 1819, William Bugbee Jr., one of William and Rebecca's five sons, purchased 81 acres of woodland designated, Lot # 5, in the second range. The property was located on the east side of Boyden’s Lake in Perry, next door to the farm of Delpha Boyden, one of Jacob Boyden's sons. In 1823, Delpha, with his two sons, Amos and Ira, built a lumber mill on a stream to the lake. In 1824, twenty-two year old Edward Bugbee purchased 60 acres of woodland, Lot # 5 in the third range, on the east side of Boyden's, next door to his older brother, William. Edward cleared 12 acres, built a simple,1&1/2 story, Cape Cod (16 feet by 20 feet), a large hay barn and established a small subsistence farm. In 1834. he married Anna Wass McCaslin of Columbia, Maine; the niece of a prominent local millwright and shipbuilder, Amaziah Nash. Their union produced six children: Amaziah Nash, John Gilman, Stephen Nash, Henrietta Brewer, Lorene Patten and Edward. In 1835 Edward sold half of his property to his younger brother John Brewer who also established a farm - three brothers in a row. The Eastport Sentinel noted in 1891, “William Bugbee and family lived near Boyden Lake and were excellent people. The Bugbees and Boydens did some lumbering." In the mid-winter of 1853, tragedy struck all three families. Edward was the first to die; it was said of typhoid fever. Two weeks later his older brother, William (within days of writing his last will and testament), also passed away. Eleven days later, John Brewer's wife, Hannah, would succumb to pneumonia, followed by their son,18 year old Elijah Kellogg, six days later. The calamity would not be complete until the following spring when Anna, passed away, three days shy of her 44th birthday, leaving all of her young children orphaned. The oldest was just fifteen, the youngest not quite four. William's young son, James McKeller Bugbee, found a home with family in Massachusetts. Considered a prodigy in his school days at the Washington Academy in Machias, he became prominent in Boston, as a journalist, police commisioner, publisher and author. One of his sons, Percy Bugbee, a pioneer of fire safety, was appointed by President Richard Nixon as the head of the National Fire Prevention Association. 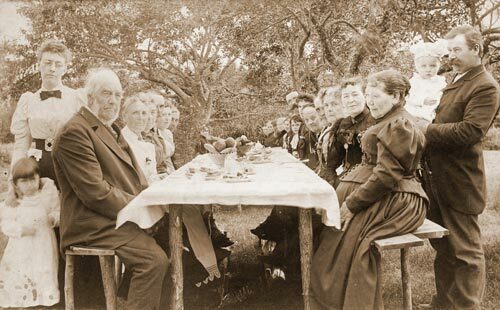 John Brewer remarried within the year and would live until 1899. One of his sons by Hannah, Thomas Sherman Bugbee, would establish the second cattle ranch, the Quarter Circle T, in the Panhandle of an emerging Texas. Another son, George Edward Bugbee, fought at Gettysburg and Antietam. After the war he went “West” with his brother, Thomas, settling in California. In later years he ran a successful ranch and farm in Bonner Springs, Kansas, where he was elected mayor in 1905. Edward and Anna's children were taken in by local families. We know that at least one, Edward, was indentured till the age of twenty-one. A newlywed couple, Robert and Jane Loring, took in the small boy. His brothers and sisters may have been similarly bound. Henrietta, found a home in the nearby town of Pembroke, on the farm of Hugh Porter, a stonemason and builder. 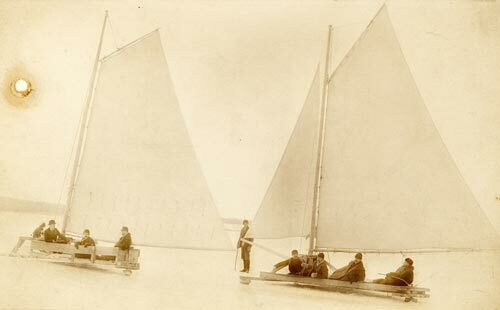 John Gilman and Stephan Nash were taken in by families in Robbinston; John with Alexander Morrison, a farmer, and Stephen, by his mother's uncle, Amaziah Nash, a shipbuilder. 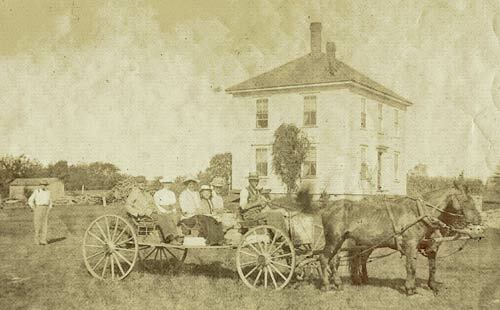 About 1856, the Morrison family, moved with John Gilman Bugbee to the Minnesota territory. 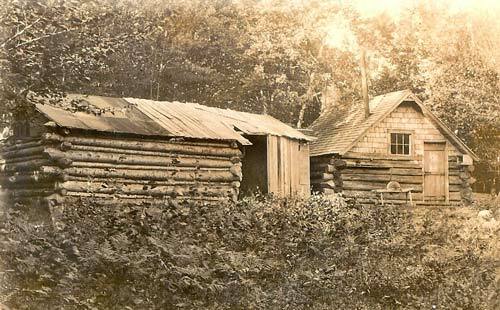 In May of 1857, Alexander staked his claim on 160 fertile acres in the "big woods" of Otsega where he would clear land and build a log cabin. Facing pestulence and economic uncertainty for the first several years, the Morrisons struggled to hang on. They would make ends meet by selling a plentiful local "weed," Ginseng, popular with the Chinese. In 1862, caught in the midst of the Dakota Uprising, the family was forced to flee to Fort Snelling. The shipbuilder, Amaziah Nash was put in financial straits by the end of the Crimean War in 1856, when need for the ships he had been supplying to the conflict dried up. This situation was compounded by the Panic of 1857, causing repercussions for all of his businesses. Lawsuits brought by his competitors eventually took everything, including the family home. 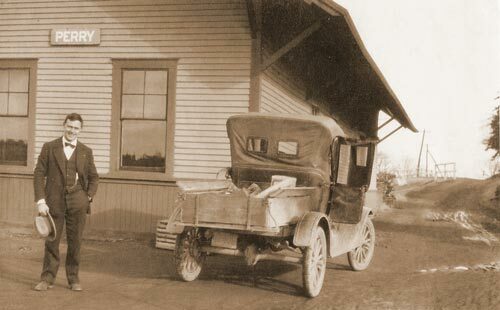 The destitute Amaziah was forced to relocate with his family, including young Stephen Nash Bugbee, to Hopkinton, Iowa. Both brothers enlisted separately and fought in the American Civil War. John donned the green uniform of the special unit of sharpshooters and participated in every major battle until 1864. He was wounded in the leg in the Battle of the Wilderness, Spotsylvania County, Virginia, in May of 1864. His reenlistment record states, “this soldier has hazel eyes, black hair, dark complexion, is five feet seven & a half inches high; occupation farmer." On the 13th,14th and 15th of July, Stephen's regiment engaged the Confederate Army in the Battle of Tupelo, Mississippi; 9 men killed, 54 wounded and 1 missing out of 200 engaged. Stephen was wounded in the shoulder; the battle was a Union victory. After the war the brothers would reunite, settle and raise families in the "sawdust" town, Minneapolis. John married Alexander Morrison's daughter, Lydia Caroline whom he had known since they were children. He took work as a millwright and a lumberjack in the winter. He was eventually promoted to the position of forman at the Bassett Lumber Mill located on the Mississippi River near the falls of Saint Anthony. Stephen married Sarah Elizabeth Williams whom he may have met through his brother. Born on a farm in Pennsylvania to parents of Welsh descent, Sarah Elizabeth lost her mother when she was still a small girl. Her family relocated to Minnesota in the 1860s. At the time she met Stephen she was living in Minneapolis with her father, stepmother and siblings in the same red brick tenament occupied by his brother. Lame from the war, Stephen found employment as a teamster - for a time with Myer and Davis and later for Miller Brothers & Fletcher, a large hardware store. 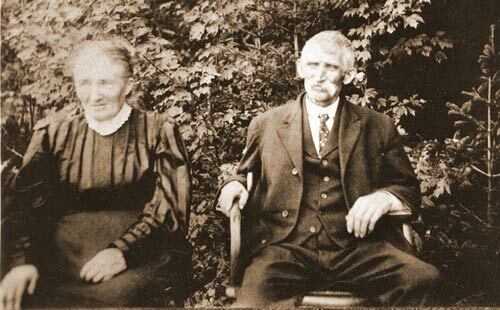 Henrietta Brewer, remained in Maine and wed George William Copp, a fisherman. They settled in nearby Eastport. where George would eventually rise to the rank of steamboat captain. Their only son, William, following in his father's seaman footsteps, was lost at sea in 1886, when he was just twenty years old. Within seven months of William Bugbee's passing in 1853, Robert and Martha Ann Golding of Robbinston, purchased his farm. Robert was a grandchild of Loyalists from Long Island, New York, who migrated to Canada after the Revolutionary War. 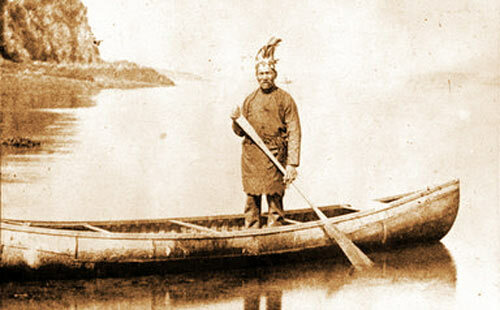 His father, Daniel "Trapper" Goulding migrated with his family to Robbinston in 1827. Robert married Martha Ann Smith of Saint John, in 1841. A stonemason, woodsman, farmer and surveyor, he layed out the Golding Road. Edward and Anna's estate, 32 acres and a house, fell into arrears and was sold at public auction in 1858, to businessman, Benjamin L Chadbourne. Chadbourne,a great-grandson of the first proprietor, Benjamin Lincoln, appeared to have been acting in the interest of the Bugbee children. 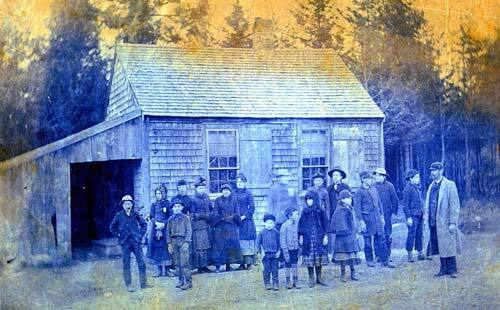 He sold the property back to the youngest, Edward Jr., for five dollars, when the boy came of age in 1864. Edward in turn sold the property to Civil War veteran, Salathiel D. Seeley and his wife, Margaret. Edward declares in the deed, "the same real estate owned and occupied by my father, Edward Bugbee at the time of his decease.” While living on the farm, the Seelys lost an infant, whose body they laid to rest in the north field. Several rocks still mark the grave. Falling on hard times (the state was heavily affected by a postwar recession), Salathiel had trouble paying his debt. He sold the parcel back to Edward the following year creating instead a contract for deed. Two years later Edward's siblings, Henrietta, John and Stephen, formally relinquished their claim on the property to their brother for five dollars. The deed read, “being the farm known as the Edward Bugbee Farm belonging to the estate of Edward Bugbee, who was our father.” In 1869 the farm again fell into arrears and was sold at public auction to the citizens of Perry. Salathiel and Edward paid the taxes and redeemed the property a few months later. 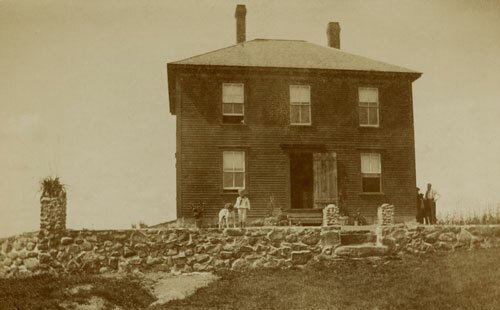 Edward sold the old homestead to Robert and Martha Ann Golding, in June of 1870. He had borrowed money from Robert Golding, starting in May of 1870 "at sundry times" and came to owe a considerable debt. A portion he worked off as a farm hand (at $3.50 per week). The price of his family farm, $175.00, was included as part of the settlement. Edward would move to Princeton, Maine where he worked for a time in the lumber camps and sawmills. He would marry Ivy Bacon and establish a stable and farm. The marriage produced five children; only one girl, Doris, survived. Around 1872, one of the Golding's ten children, Nathaniel, with his new wife, Mary Frye, moved into the aging cape. A farmer, stonemason, woodsman, hunter, trapper, fisherman and guide, Nathaniel also played the fiddle. He was an adept broom-maker; a skill he learned from the Boydens who acquired it from the Wampanoag Indians. Mary, a former schoolteacher, was a skilled weaver, quilt and rug-maker. 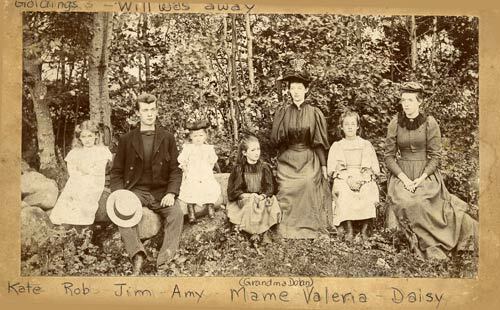 All nine of their children - Mary ('Mame'), Rob, Francis, Daisy, Valeria ('Vi'), Will, Amy, Kate and Jim - were born in the Bugbee homestead. About 1893, the Goldings built a new home; a simple, hipped roof, two-story farmhouse with its central front door facing the Golding Road. 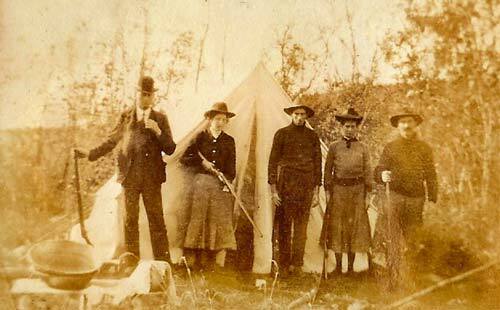 They moved the Bugbee cape down to the lake and turned it into a camp; renting, at the turn of the century, to J.W. Raye, who served with their son, Rob, in the Spanish American War. 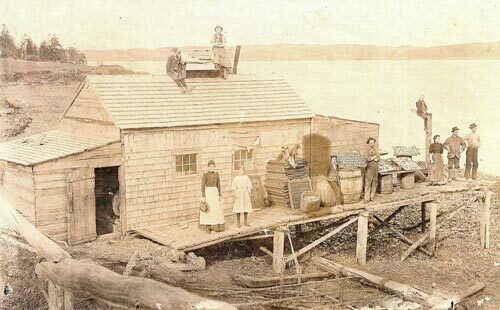 In the late 19th and early 20th centuries, Raye's 'stone ground' Mustard Mill in Eastport supplied Maine's burgeoning, sardine industry. The Goldings had their share of tragedy. They lost a baby, Francis Edward, just shy of two months old. Their daughter, Kate, passed away at a tender age,15, of "aortie insufficiency" a condition probably brought on by a bout of Rheumatic fever. According to her brother, Rob, she lay down on the couch in the kitchen for a nap and never opened her eyes. Her school report card (found in the attic) reveals a straight 'A' student with consistently excellent deportment. Their fifth child, Will (a member of the Maine Militia), succumbed to frigid springtime Boyden waters, when his sail-rigged canoe capsized some 60 rods from shore. He was attempting to cross a blustery lake, to see his sweetheart, Flossie Taylor who lived at the head of the lake. So esteemed was he held by the community, that at his funeral, some 300 people filled the house and yard while his regiment fired a volley. After the deaths of Nathaniel and Mary, early in the 20th century, the property passed to their son, Robert Nathaniel Golding, a well-loved local figure, and a talented story teller. Many of his yarns are archived on audio tapes in the University of Maine Folklife Center and movies at Northeast Historic Film in Bucksport. They were recorded by his friend, Thomas Archibald 'Archie' Stewart and contain wisdom, wit and recollections of life and family in the late 19th and early 20th century Maine. Rob would pass the property to his daughter, Virginia, a school teacher, in the early 1950s. In the 1970s Virginia rented to the Leavitt family. Robert Leavitt, a linguist educator, was working with the local Passamaquoddy and Maliseet tribes to represent their words phonetically and produce a definitive dictionary - insuring the preservation of their language. Over thirty years in the making, the dictionary was published in 2008 by the University of Maine Press, with 1,214 pages and over 18,000 Passamaquoddy - Maliseet entries. Leavitt co-authored the tome with tribal elder, David Francis. A heroic birch-bark etching by one of the Passamaquoddy's most revered artists, Tomah Joseph (1837-1914), is reproduced on the dust cover. Culling their words in a unique way, from the conversations and stories of native speaking tribe members, the dictionary's definitions provide an extraordinary glimpse into the culture and traditions of the area's first residents. Read more about our restoration of the Golding House.